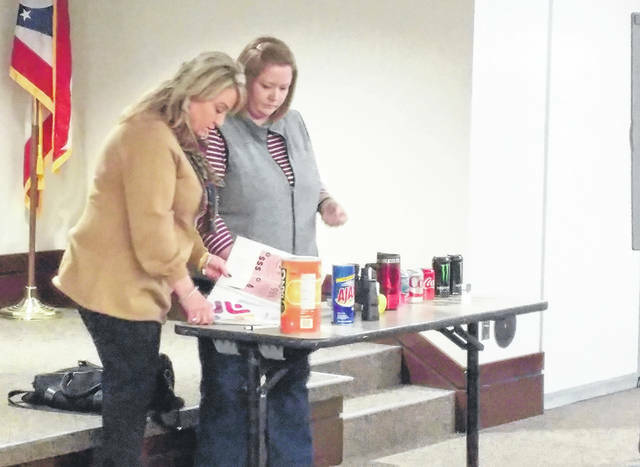 Lisa Osborne, left, and Selina Mitchell, right, display various items donated to Gallia Citizens for Prevention and recovery to display how drugs may be hidden at a previous meeting. GALLIPOLIS — Members of Gallia Citizens for Prevention and Recovery gathered in Haskins Park Wednesday afternoon to discuss Hidden in Plain Sight project efforts along with data collection techniques focused on recording substance use trends in youths. CPR members Selina Mitchell and Lisa Osborne previously visited a program called Hidden in Plain Sight and have been spearheading Gallia efforts to start a similar program in the area. Hidden in Plain Sight focuses on teaching parents what to look for in their child’s bedroom if they suspect drug abuse. The pair have been working on collecting everyday items to create an exhibit of a youth’s bedroom. In that room will be placed objects such as lighters, faux soda cans with empty bottoms and other such items that could indicate drug transporting or substance abuse. The group also seeks to potentially survey or discuss with area youth behaviors they have witnessed that might indicate substance abuse or how to prevent it. According to Board of Gallia-Jackson-Meigs Alcohol, Drug Addiction and Mental Health Services Associate Director Angela Stowers, she suggested CPR members potentially contact the Meigs OSU Extension Office to learn of its survey techniques with youth as she felt they have had success administering studies. Ongoing surveys and studies would need repeated over a course of time in order to get an idea of ongoing and future trends with a hyper local focus on youth substance use behavior. Doing a survey over the course of the upcoming Gallia Junior Fair was also suggested during the meeting as a beginning point for future presentations of a Hidden in Plain Sight program. At some point in the future, CPR intends to invite the public to observe the youth bedroom exhibit and a presentation of drug hiding techniques, new substance ingestion techniques and, ideally, to learn of the numbers of local youth taking part in such behavior.